We offer introductory sessions that allow us to evaluate how the client moves, find out his/her goals, and any time, financial or physical restrictions the client may have. From this information we develop a program that best suits the client’s needs for in the studio, at home and application to any other activity he/she may do. A variety of programs are offered, depending on what type of session a client chooses and how many sessions he/she buys at once ($33 to $85 per hour). Prices subject change. Solo sessions: Half Moon Bay $75 – 80, half hour $46 – $52 and San Francisco: One hour: $77 – $85. half hour: $46 – $52. Duet sessions: Half Moon Bay $46 – $52. and San Francisco: $50 – $55. Trio/Quartet/Quintet apparatus sessions (Half Moon Bay $33 – $35 and San Francisco: $35 – $40). Group Mat classes. None available at the moment. All classes use Mat and Apparatus. Discounted sessions taught by Apprentice Teachers. Bodywork, workshops and movement sessions based on the teachings of Moshe Feldenkrais by Jeff Smith. Workshops and seminars taught by renown health practitioners. 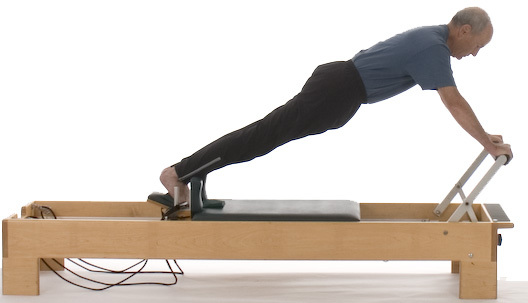 The Peak Performance Pilates Teacher’s education program. Semiprivate apparatus (duet, trio, quartet, quintet) classes are available by appointment. Participants are matched according to level, skill, time availability and by the presence of injuries. Class size in San Francisco is limited to no more than 5 clients. In the Half Moon Bay studio class size is limited to no more than 4 clients. See more quotes on the teachers education page.